I’m playing catch-up today with a long overdue post. I joined DiverseAThon in January – a great prompt for me to read more books by diverse voices. I do read widely, including many books in translation, but when I looked at my shelves I realised these are mostly European (and mostly men). Here’s to broadening my reading horizons. So, what diverse reads did I have on my shelves at home? Still pretty mainstream, but a good start. I’m going to aim for more diverse reads this year and keep reading in translation (books in translation perhaps a blog post in itself). Shelter by Jung Yun: A pity I can’t show you this one because the cover was beautiful! (different to the one in the link). This was a drama centering on a Korean-American family. It was challenging as I did not warm to the characters, but real and compelling: I wanted to know what would happen next. I must say, I didn’t enjoy it, but it has stayed with me as an honest, strong, well-written book. The Sellout by Paul Beatty: I absolutely loved this. Strong, fizzing, inventive prose and on-point commentary about racism and Amercia. Beatty skewers, subverts and glorifies in race issues and America’s uncomfortable past and present. I laughed out loud, stopped to think and otherwise just enjoyed the ride. Highly recommended. The Good Immigrant edited by Nikesh Shukla. An excellent collection of essays – fresh writing, highly readable. An important book if for no other reason than to open our minds, remind us what a diverse world we live in but bring home that things like humour, wanting to connect and the magic of a good haircut are universal. But mostly just a great read! Darren Chetty writes a wonderful essay on teaching children to write using characters from their own background – the resulting stories are stronger with more emotional engagement. Varaidzo, Miss L (on being cast as ‘the wife of a terrorist’) and Salena Godden were also highlights. A shout-out to the London Book Club for this winning Secret Santa gift! And yes, I know, I have not updated on my holiday reading from December/January. Yikes! While I think about how many blog posts I need to catch up on and all the books I’ve read over summer, and all the books still to read, here is a photo of Carrickalinga Beach. What have you been reading? Do you have any diverse or Read Harder recommendations? When is a book haul not a Britney Spears-style “Oops, I Did It Again” splurge but a plan for the future? Let’s call it Christmas shopping. For my husband: The Dream Songs by John Berryman – this has been referenced by the Hold Steady and Nick Cave among others (music is to my husband as books are to me) and seems to be essential poetry. White Rage sheds light on the state of American politics which will interest him, especially at the moment. For Mum: Hot Milk is beautifully written, poetic and evocative – I can still feel the arid sun of Spain after reading it – and has a mother-daughter relationship. It portrays the mother as a troubled hypochondriac so that might be awkward? Mum also loves Salley Vickers so Cousins is my back-up plan. For Dad: The Devotion of Suspect X is new to me this year – I love the easy style and the idea of crime as a maths problem and the detective, physicist and mathematician sparring with each other – this should appeal to Dad, who is an engineer and crime fan. Black and Blue with Ian Rankin’s dry humour and Edinburgh setting also fits the bill, or the latest in the Rebus series Rather be the Devil. I Contain Multitudes ticks the science box. Ed Yong is wonderfully erudite and curious and writes like a dream – this inspired me to eat widely, open the windows and clean the bathroom less. For our god-daughter (aged 12): Murder Most Unladylike recommended by Adventures with Words. She likes funny books and this sounds like a good feisty heroine. Girl Up is an important book for future fesity heroines: funny, accessible and inspiring advice from Laura Bates of the Everyday Sexism project. For my friend: The Door – her family is Hungarian so this will resonate, with the backdrop of post-war Budapest, but it’s also a rich story about female friendship with a singular older woman. We read it for London Book Club and there was much discussion about our treatment of older people and how the story was uncomfortable but rang true. For the Adelaide Book Club: the new Famous Five series – including Five Give Up the Booze. I could not resist! For me: The Master and Margarita has long been on my TBR. Vintage are reissuing the Russian classics with gorgeous covers designed by Suzanne Dean, so I’m adding this to my wish list. Shelter has a more contemporary but beautiful cover and sounds like a dysfunctional family par excellence. Absolutely on Music is a gift to myself – I love Murakami’s deceptively simple writing and deep knowledge of music. This (following Do Not Say We Have Nothing) will kickstart my classical music listening for 2017. Music and Freedom by the super-talented Zoe Morrison, which won the 2016 Readings Prize for New Australian Fiction. The Good People by Hannah Kent. The Trouble with Goats and Sheep by Joanna Cannon, winner of the Books Are My Bag award for breakthrough author, in a strong list. And to give: $1 can buy one local language book for a child in a developing country, via Room to Read. And for those in the United States, #GiveABook sounds like a great initiative to provide books to children in need. London Book Club: We each bring a book to Christmas dinner, as a gift from Secret Santa. What to choose? I’ll need another trip to the bookstore…..
Book Riot alerted me to it, Oprah celebrated it, Colson Whitehead disarmed me with his self-deprecatin g humour on the Inside the New York Times Book Review podcast (on reading Toni Morrison’s Beloved as he was writing his book: “I’m screwed!”) and it’s been nominated for a National Book Award. So, it was like a rock star had finally come onto the stage when I saw The Underground Railroad for sale in London this month: I had to read it. The subject-matter – slavery – was as somber as the expectations were high. So, I’m happy to report that, whilst relentless and confronting, it is not a heavy read. Whitehead writes with supple prose, moving the story forward (and occasionally back); the action and imagery akin to cinema. The story centres on Cora, a slave in Georgia. Cora runs away with Caesar via the underground railroad (historically, a network of people helping slaves to escape to the north pre – Civil War). Whitehead reimagines this as an actual railway, giving those scenes a slight Alice in Wonderland feel. It’s just plausible enough to be realistic: no flights of fancy required. Cora travels through South and North Carolina, Tennessee and Indiana, pursued by the slave-catcher, Ridgeway. Stories of Ridgeway are interspersed, along with Cora’s grandmother, Ajarry and her mother Mabel. Whitehead does this well, as an interesting digression, so it doesn’t obstruct the narrative. Ajarry was separated from her family and we discover on page 4 that they died, but she imagines them working for “kind and generous masters” and perhaps freeing themselves. This is matter-of-fact writing – clean, beautifully edited – the tone warm and engaging, but depicts scenes of horror. I was compelled to read on, enjoying the pace and Cora as a feisty heroine. Whitehead achieves a balance between this and the atrocities going on all around, which stop you in your tracks at times. I came to this book knowing little about slavery. I had no idea of the violence, including torture; and the sinister methods in some states which used slaves as medical guinea pigs; down to the everyday examples of segregation. I learnt how pervasive was the social norm to keep the slaves repressed. The book shines a spotlight on slavery in all its forms, while Cora moves from place to place and meets diverse characters, who take risks to help her. Cora is symbol of the slave struggling to be free; and at times her story is secondary to the larger picture, of slavery at work in different parts of America. Whitehead’s descriptions of the violence done to slaves are to the point and lucid, but make uncomfortable reading. Ordinary people would, for example, enthusiastically watch a hanging as Friday night entertainment. How can humans (ordinary people, of their time) be capable of such cruelty? At this time (with modern day slavery affecting 21 to 46 million people and racism seeping into the US election, Brexit and the European debates over refugees) – at any time – this is an important discussion. Whitehead brings the issues to life with great clarity, without being preachy or judgmental. Much to think about, and I was taken from the story into the world of ideas. The only slight drawback – worth the trade-off – was that I saw the characters as actors in a bigger story rather than feeling they were real, with flaws and ambiguities. This is a book filled with ideas: eloquent and powerful, it will be talked about for a long time. It is a must-read. India reportedly has the highest number of slaves today. This brings me to another book I read recently, not on this topic but on the theme of running away: The Year of the Runaways by Sunjeev Sahota. It tells the story of three Indian men who go to England, fleeing dire lives (though nothing like Cora’s experience) and a woman, Narinder, who marries one of them, Randeep, to help him obtain a visa. Sahota stays on the more intimate level of the men and Narinder, and their stories; it does not make pronouncements about immigration. It is looser than The Underground Railroad. But I found it immensely enjoyable and stayed up late to finish it, wanting to know what happened to the characters. In the process I gained a new understanding of people who come to places like London, and their struggles. The characters are deliciously flawed – you would dislike one on one page, and be on his side on the next. Their conflicts and mistakes make them human. It quietly raises issues that are complex and hard – what to do if you are in England illegally, supporting a family back home and desperately need work – would you accept poor pay and conditions? In a capitalist world, every individual for themselves, when is employment exploitation? Slavery? As a post-script, I saw that the police raided the Shiny Hand Car-wash in Carlisle recently, reporting “no offences” in terms of modern day slavery or immigration. A far cry from Cora’s trials, but the issue has not gone away. Is there anything positive to emerge from slavery? No, but its survivors had children, and one of their descendants is Michelle Obama – a bright, shining star as far as I’m concerned and unafraid to have a discussion, about the White House being built by slaves or sexism in the presidential campaign. What to read next? I’m inspired to follow up with Beloved by Toni Morrison and Homegoing by Yaa Gyasi. What do you think? “There are rules,” he said. They stood in an army disposal store that sold all manner of things. Together they inspected the old printer’s tray. 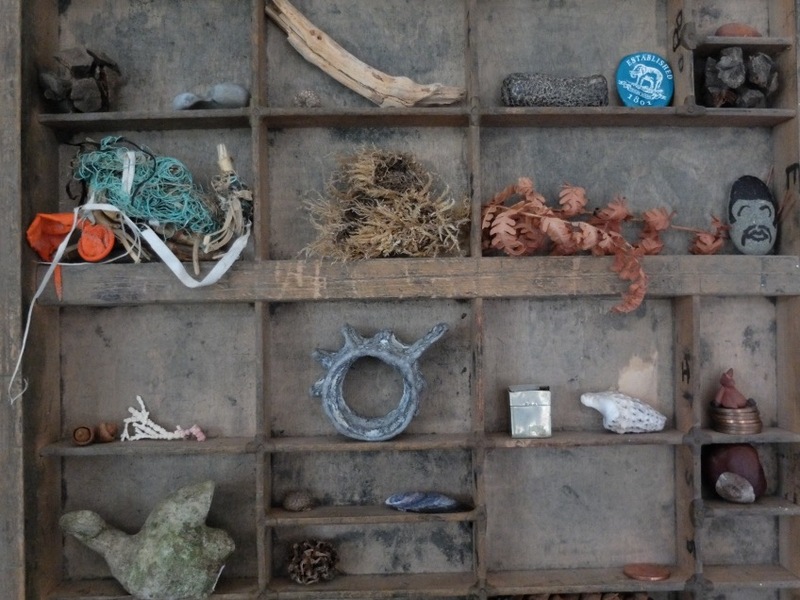 “Found objects.” The storekeeper was proud of this term, something he had heard an artist say once. This is Friday Flash Fiction. Picture supplied by Claire Fuller. So said Benjamin West of the portrait painter Gilbert Stuart, whose portrait of George Washington hangs in the Frick Collection. The humour hides unspeakable horrors, in the way that Kurt Vonnegut in Slaughterhouse Five is funny, until you realise it is walking the line between laughter and tears, and skirting around the shocking events of war that the characters cannot face. How is that for an opening, by the way? War also exposes the ambiguity of right and wrong, even as some cling more tightly to their convictions (Captain is a Communist sympathizer, but it becomes hard to tell who is ‘right’, when his victims show humanity and his mentor inflicts cruel torture). Nguyen explores guilt and innocence, as well as loss of innocence. The Captain is interested in the concept of ‘original sin’ and carries Catholic guilt with him, but also considers himself, if not innocent, at least adhering to his own conscience, until events take their course. The Captain can laugh at himself. This is what makes him so charming and for me was the saving grace, because the book is confronting and would be too violent or depressing were it not for Nguyen’s light touch. But there is an underlying sadness and disillusionment too, as the Captain knows that ‘traditions persist’ but the country of his youth is gone. Nguyen weaves these themes and more through the story. But the stand-out for me is the language. It is alive on the page, vivid and visual – I can imagine this as a film. I loved the wordplay and found, as I was checking for quotes, that I could keep going endlessly because the prose is so strong. It feels like Nguyen is having fun, but is angry too. He succeeds in striking a personable tone while balancing rage with wit, a huge achievement. I was inspired to read this as a summer read-along with The Readers. Thank you, Simon and Thomas! I would not have picked it up otherwise. As a post-script, Nguyen’s latest book Nothing Ever Dies: Vietnam and the Memory of War has been longlisted for the National Books Awards for non-fiction. Watch this space! Two rules are at play: 1) it can be as light as light as can be, but must be well-written. I want to feel inspired by an author smarter than me, not cringe at cliches or clunky phrasing: No 50 Shades of Gray. 2) nothing too challenging. No War and Peace or Narrow Road to the Deep North (both excellent though). It’s a tricky balance – I have huge respect for authors who manage it. On the other hand, I agree with Thomas – any book that draws you in and entertains you can be a good escape. P.G. Wodehouse: fail-safe, timeless, always lifts my spirits. In the words of Evelyn Waugh, his “idyllic world can never stale”. Harmless but genius writing. This article in the New Yorker explains some of the appeal. We visited Sydenham Hill Wood recently and the guide map said “The Pond .. supports dragonflies and newts” – just the word newt made me laugh, conjuring up Gussie Fink-Nottle. You must read his speech at Market Snodsbury Grammar School, in Right Ho, Jeeves. Douglas Adams (Hitchhiker’s Guide to the Galaxy): escape to outer space, brilliantly conceived. Funny, masterful, another genius. A good detective story: Agatha Christie or Dorothy L Sayers for classic English crime. Recently I’ve discovered Judith Flanders, who does a great a great crime caper (Murder of Magpies). Boris Akunin has been compared with Sherlock Holmes but has a comic Russian element. And Donna Leon’s Commissario Brunetti series (starting with Death at La Fenice) blends crime, Venice and food – what’s not to love? A good setting can be key. By good I mean not war-torn; ideally a grand hotel by the sea, a bucolic village or a cultural European capital. Another recent discovery: Hotel du Lac by Anita Brookner. I felt like I was holidaying in a resort by the lake (funny, that), breathing crisp mountain air and Edith was in my ear whispering her observations about the guests. There is some depth and sadness, but it’s treated with a light touch. The quality of the writing is absorbing enough to block out the read world. Speaking of mittel-Europe, Stefan Zweig – he wrote during troubling times but he illuminates small incidents, details and characters with a humane sensibility and a reassuring tone – as if someone is simply confiding a story. My favourite is The Royal Game, a novella that takes place on a cruise: short in length, an escapist setting, tick, tick! The Fly Trap by Fredrik Sjoberg. Sjoberg collects hoverflies on a remote island in Sweden. Somehow this is one of the most comforting, wise books I have read. I highly recommend it. Which brings us to Scandinavia: Tove Jansson’s The Summer Book is everything. Another means of escape is a sweeping story to immerse yourself in. Some of my favourites are: Burial Rites by Hannah Kent (so excited for her next book The Good People due in October); The Woman in White by Wilkie Collins and The Essex Serpent by Sarah Perry. All have a strong sense of place too, so you really can enter into another world. Bliss! Actual travel, anyone? I love the travel writing of Dickens, and the slim volume On Travel is full of insights and funny scenes, with his sense of theatre and comedy. Edith Wharton’s Cruise of the Vanadis is a beautiful book and leisurely escape – relax with a coffee and enjoy the Meditterranean islands and Wharton’s eye for detail. Bill Bryson’s early travel writing is clever and entertaining. And for 1970s New York, the The Andy Warhol Diaries are a revelation: fun and name-droppy to dip in and out of, or a full literature experience with Warhol as the protagonist. Leaving Microsoft to Change the World: John Wood’s memoir about starting Room to Read is an antidote to the ‘world problems are overwhelming’ blues. Wood – a self-confessed library nerd and avid reader – is funny, engaging and optimistic. The message: world change starts with educated children. The good news? He is on it. What are your favourite escapist books? My idea of beco ming vegetarian is cooking greens from Ottolenghi’s Plenty or Annabel Crabb’s Special Delivery, forsaking Parmigiano Reggiano and eating lentils, to bask in the glow of a healthy new lifestyle (I couldn’t do it: I subscribe to Michael Pollan‘s dictum ‘meat as flavour’). Not for me, then but it’s a respectable choice in the cities I call home – London and Adelaide – increasingly common, and the waiter won’t turn up their nose if you order the leek tart instead of a steak. Not so in Korea, or at least not for Yeong-hye in The Vegetarian (by Han Kang, translated by Deborah Smith). Her story is a noir film to Gwyneth Paltrow’s Disney macrobiotics. Whilst the husband and his colleagues come across and selfish and shallow, his words contain a truth: Han Kang has made Yeong-hye quite unknowable and leaves the reader to understand her, and people who challenge accepted norms, as best we can. (Her husband fails this test). By the end of Part 1 I could relate to the husband’s view – this shows the strength of the writing because he is an unimpressive character who does not emerge well from the story. It’s interesting how affronted we are (me, her family) by Yeong-hye’s rejection of social mores – shown by her withdrawal from food and conversation and from her husband (“The meat smell. Your body smells of meat,” she tells him). A better husband might offer her support or treat it like an illness – his wife as a convalescent – or simply let her be. But her conversion reveals that they never understood each other. She seems to hate her body – feeling it murderous – but cannot escape it – causing huge torment and tragedy. Part 2 focuses on Yeong-hye’s brother-in-law, who is presented as a selfish man neglecting his family in pursuit of his art. He is willing to sacrifice all for his art and exists outside the ‘norm’ in the artistic realm. There is a fine line between unhinged and creative. Finally we explore her sister’s life. In-hye is a dutiful, diligent wife and mother, always thinking of others and supporting the family with her career. The irony, or tragedy, of the tale is that Yeong-hye and her brother-in-law have been true to themselves and pursue their destiny even when it is destructive, while In-hye lives for others, conforms to all of society’s demands and expectations, but does not know herself. There is much else in the third section but I won’t give it away for fear of plot spoilers. Perhaps one lesson to be drawn is that a society made up of indivuals is going to be messy. How much should people conform to general rules of behaviour (and what to do with people who cannot or will not do so)? Or is Kang saying: our instinct is to look after people when they are hurting or starving themselves, we want to fix it, but just let them be. Would that be fair though to friends and family – is it OK for Yeong-hye to opt out? Hard to believe, but my musings on The Vegetarian led to a movie I saw the same week, premiering at Somerset House, Captain Fantastic. Viggo Mortensen plays a father who has opted out, raising 6 children in the wild with home schooling and survival skills – a boot camp that makes a mockery of both my feeble attempts at exercise (I don’t want to know how long they held that plank for) and the M&Ms I ate throughout the film. Viggo Mortensen is superb: his pathos, blunt tactlessness and love for his children hit the mark. The family is dragged into the city when their mother dies – there is a telling scene with his sister’s family with two typical teenage boys and the full range of modern parenting: the parents are alarmed at the frank discussion of Leslie’s death; they try to cover the truth with “She was sick and … she died” lest their boys are disturbed; these same boys are seen shortly afterwards playing violent video games. Leslie’s father is horrified at the children being raised outside the education system (despite their precocious knowledge of the Bill of Rights) and wielding knives. Matt Ross’s clever writing means we sympathise with both sides, although the parents are presented as narrow-minded. It raises the question again, is it OK to ‘opt out’ of modern society? Can you give your children the best education with honesty and without the dangers of modern life, and is that valid? Should more people do it? And what is a father’s obligation: to be true to himself (= live in the wild) and/or is that best for the children? The kids seem happy in the movie and the love of their parents the supremely important thing – tick, tick so far. So long as they have choices at the age of 18 (nearly denied to the eldest) they will be fine. This debate goes back to Plato and answers vary today from country to country. My view is that home education beyond age 8 or 9 cannot prepare children for living and working every day with a group of people who are different: the interpersonal skills, dealing with adversity and the opportunity to learn from their peers (other points of view!) best prepare young people for the real world. On the other hand I can understand parents wanting to shield their children from the often brutal school environment. And not every school fulfills its promise. The topic arose too in The Shepherd’s Life by James Rebanks (Twitter sensation), where a school in the farming community both set low expectations of its students and told them to ‘aim higher’ than farming and apply for university, thus alienating a whole group of capable young people and turning them off education completely. I’ve taught at a small area school in a farming district in South Australia where farm life was incorporated into the curriculum and the school encouraged academic success in its students: a flexible approach can help. I hope this has changed in Northern England and it is vital that rural schools are well funded and attract good teachers. Intelligence comes in many forms.